Heat olive oil in a saucepan over medium high heat. Add ground turkey and cook until browned, about 3-5 minutes, making sure to crumble the beef as it cooks; drain excess fat and set aside. Add garlic, bell peppers and onion to the saucepan. Cook, stirring frequently, until tender, about 3-4 minutes. 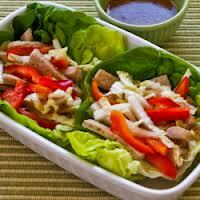 To serve, spoon several tablespoons of the turkey mixture into the center of a lettuce leaf, taco-style. Serve with rice.